OTTAWA - The moment that soccer fans in the country have been waiting with bated breath has come true: United 2026 have won the rights to host the 2026 FIFA World Cup and Canada will get to host the beautiful game with the world's biggest sporting tournament. While soccer fans in the entire nation will be rejoicing, there's a select bunch of people who might be happier than the rest. 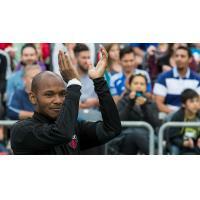 Ottawa Fury FC General Manager Julian de Guzman is one of them. He was selected as one of the seven Canadian ambassadors for the United 2026 bid and to see this initiative come to fruition would be of great joy to him. From being a player to a coach, and then a GM and an ambassador, the journey has been a remarkable one for this humble all-time Canadian soccer great. "I'm thankful to be recognised as an ambassador. I'm thankful to be recognised as the GM of Ottawa Fury FC. I'm thankful to be recognised as an ex-Canadian professional who has played in some of the top leagues, if not the top leagues in the world," said de Guzman. From a 21-year-old playing his first game for the Canadian Men's National Team to becoming the all-time leader in National Team appearances with 89, de Guzman has travelled the world playing in the top leagues in the world, putting Canada on the map. "My objective as a Canadian playing soccer was to put the Maple Leaf on the map. Whether it's in the La Liga, the Bundesliga, the NASL or the MLS, I've felt that was my task. Every time I was to put on a pair of boots, it was to make sure that I made my country proud," he said. "And here I am now dressed as an ambassador. That vision has never changed. I want it to be known that Canada does deserve a spot in the world for soccer," he added. De Guzman has always been a vocal proponent of promoting Canadian talent and this is more than evident with his vision for Fury FC. From a player to a coach and now a GM, he is unequivocal about providing a platform for Canadian players to showcase their talent. "Creating a soccer culture in Ottawa is also a part of helping create a culture in the country. We want to be identified as the club that's the reference for soccer - not just here in Ottawa but everywhere else where there's a fan of soccer in Canada. We want to be known as that team in Canada, that Canadian club, that makes you feel Canadian," said de Guzman. The Scarborough native, who travelled the world, knows how tough it is for Canadians to make a name for themselves in the world of soccer. De Guzman did it the tough way but he wants the future generation to have it easy. "I've been that guy who was once a Canadian playing soccer - looked down upon and ridiculed in the past because I was a Canadian. But I didn't allow that to affect my ability to do what I was good at and carry my passport high and proud. This is what I'm here for - to share that story and give back to not just a club in the capital city but also to the country," he said. With the FIFA World Cup coming home in eight years, there will be a lot of hype leading up to, during and after the event and de Guzman the ambassador is keen to leave a lasting legacy. "I think it's been my duty to be that guy to put forward the Maple Leaf and make everyone feel proud and confident about it. And inspire more leaders to follow these footsteps and be an even better example down the road." For more information on the Canadian Ambassadors for United 2026, visit canadasoccer.com.